well-being focused on Reason, Exuberance, Athleticism (exercise and nutrition) and Liberty. 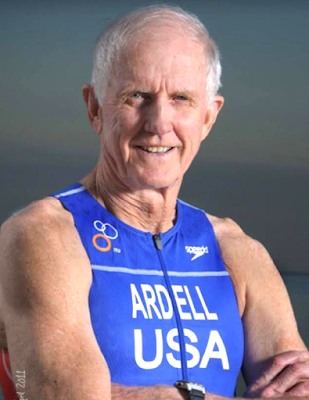 I have written 15 books (latest is Not Dead Yet: World Triathlon Champions 75 and Over Offer Tips for Successful Aging) co-authored with Jack Welber), and produced/distributed 855 editions of the ARDELL WELLNESS REPORT (free subscription here) since 1984. I also have two patents for a no-hands, no-bending heel entry running shoe system for fast transitions in triathlons from the bike to the run. When did you start running and WHY? In 8th grade. Most of my friends growing up in Philadelphia were sprinters, but I clearly was not. I became a miler in high school (4:38 PR) and also ran cross-country. My basketball interest and skills matured during a tour in the Air Force where I played on Air Force teams, which in turn led to a full basketball scholarship at George Washington University. I played handball extensively after college and graduate schools, winning state titles in the Twin Cities of MN. At 39, I started running again after a 20-year hiatus. I thought I might do okay the next year as a masters runner. How much did you run in your peak years? 40 to 50 miles per week when I was competing in marathons in my 40s. My total lifetime miles are 62,413.05. How much are you running and cross-training now? I run no more than 7 miles per week; usually less. Specifically, 20 minutes at easy pace, plus four 1 minute pickups at 7:30 per mile pace. I swim three times for 30 minutes. I bike four times, about 60 miles a week, mostly on a stationary bike. I do strength work twice a week, 30 minutes at a time. I do no stretching whatsoever. I rarely race any long, though I did a 26:20 5K in Madison, WI, last summer. 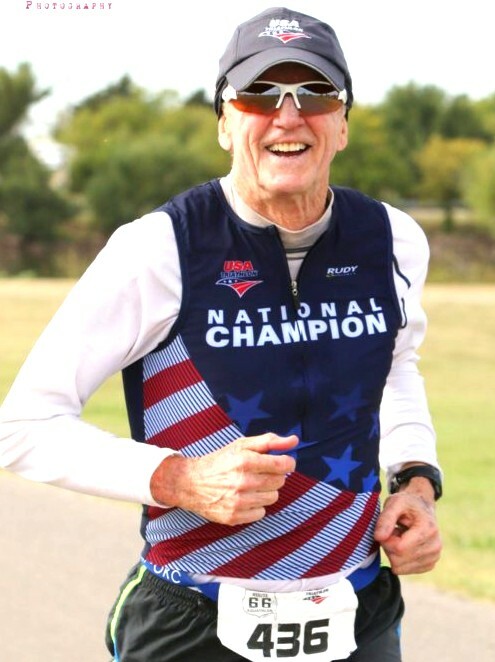 I also entered five sprint distance triathlons/duathlons in 2018, winning my division (80-84) in all, including the triathlon (Cleveland) and duathlon (Greenville, SC) national championship events. Does it bother you that you are slower now? No, since it's not my fault! It happens to everyone. It's life. I find it best to accept realities and find other satisfying ways to remain cheerful and distracted from feeling gloomy over declines with age and other unpleasant existential realities. In my new book, Not Dead Yet, eighteen world triathlon champions over 75 explain how they maintain motivation against the onset of frailties and the nearness of death. The common denominator is acceptance of that which cannot be changed in favor of a focus on ways to flourish. Almost all embrace a mindful awareness to enjoy the time at hand, grateful for their longevity and especially their quality of life. How have your diet and weight changed through the years? I weighed 170 after college and 165 now. I have made many diet changes. 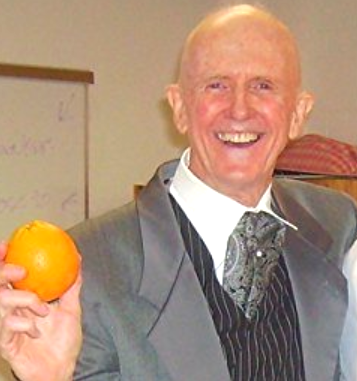 While I always enjoyed a relatively good diet, I switched to a whole-foods, plant-based diet in 2011. Supplements? None. Unless shown to be necessary via testing by medical experts with no conflicts of interest, I believe they are a waste of money and a potential health hazard. What injuries or other health issues have you faced? As a runner, the usual physical travails - infrequent but annoying overuse issues, such as heel spurs, shin splints, calf tears, episodic back troubles and a meniscus tear. These problems were almost entirely eliminated when I switched from only running to swim/bike and run training (in 1984). My biggest health issue would be a stroke on the next to last day of 2015. I was less than a mile into an easy run along the St. Petersburg waterfront when I found myself sitting on a curb, bleeding and being offered assistance by passers-by. I had no idea what happened. I thought maybe I had tripped. This changed when a tourist from Vermont stopped, introduced himself as a cardiologist, and took control. I was in a nearby emergency room within an hour of the fall, and give tPA (tissue plasminogen activator) that immediately dissolved the clot and improved blood flow. I have lived happily ever after, and learned that the brain clot was no doubt brought on my atrial fibrillation. Ever since, I've taken a prescription med, apixaban, that helps prevent blood clots (and thus strokes). This means my blood is always thin, and I bleed easily. A fall on a bike might precipitate fatal internal bleeding. For this reason, I quit cycling (and thus triathlons/duathlons) for two years. That is, until 2018, when I turned 80 and decided to go for it, at least for a year. I resolved to be careful and to hope for good luck. So far, so good. What 3 short tips you offer those who hope to become lifetime runners? 1--Have a solid base before doing much interval training or racing. 3--When you get past age 50 or so, pay attention to episodes of shortness of breath when starting a run. Atrial flutter and Atrial fib are conditions common to older endurance athletes, so monitor or have your heart rhythm monitored periodically. How does running & fitness help you on a daily/weekly basis? Running and other physical exercises are the closest we have to magic bullets. Absent regular exercise of sufficient duration and intensity, we deteriorate in countless ways; with it we prosper long and as late into life as possible. How would you describe your philosophy of life, running, and aging? We live on what Carl Sagan memorably called, "a pale blue dot" as seen from the other side of the moon. That dot, planet Earth, is a small part of a larger solar system, which itself is much less than a dot in our galaxy. Therefore, my philosophy is founded on a belief that I am probably not the center of the universe. What, then, should I believe? Only that my existence is amazing and unlikely, short and subject to random and inexplicable events and circumstances, and of little meaning whatsoever, save what I invent to animate and direct my days. I choose to believe in common decencies, science, reason, love, kindness and hope as the consolation of the world.